Bitcoin continues to tumble lower and lower as it struggles to claim any footing in the market. It’s down almost 50% in three weeks and it’s showing very little sign of stopping. It’s currently clutching onto the $3,500 values but it doesn’t look like it can hold on much longer. Unfortunately, the consequence of a parabolic market is that, toward the tail end of the parabolic move, it doesn’t bother to retest or establish strong support. And now bitcoin is brutally busting through all the untested support levels. The figure above shows all the untested support levels (in blue). 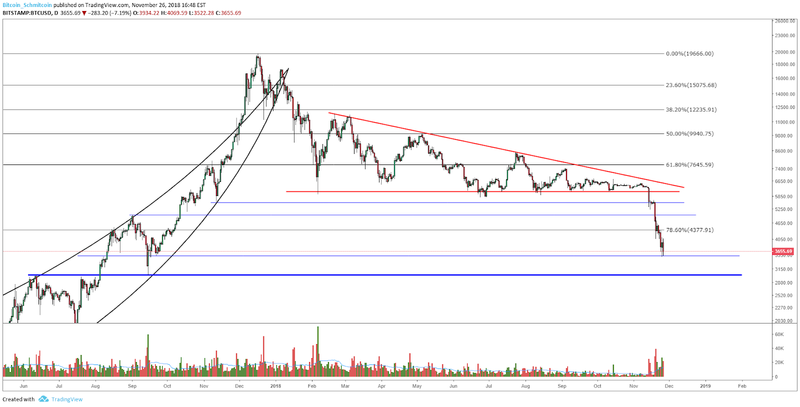 If we manage to break current support and test the $3,000 area, I think we will start to see some larger players take up positions in bitcoin. We will have to keep an eye on the volume, but this capitulation is expanding in volume and spread, and there will eventually be a snapback in price action. There is an entire group of so-called “smart money” that has been patiently waiting on the sidelines during this entire bear market and they are waiting for the right time to re-enter the market. These are people/entities that are likely to take up large, long-term positions that won’t be easily shaken out. Historically, bitcoin has retraced somewhere between 80-90% during parabolic blow-off. If we manage to test the $3,000 area, that would essentially be an 85% retracement from its all time high. Bitcoin has seen a brutal decline in value over the last few weeks. It is currently down almost 50% in three weeks and is showing very little signs of stopping. Because we rose so fast during the bull run, there were never any established support levels for the market to find a foothold on the way back down. Currently, we are in the process of blowing through untested support with great ease. 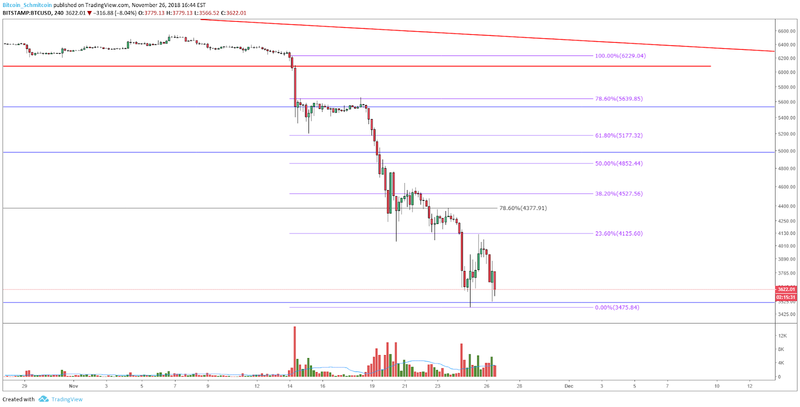 If we manage to break through the current support level, we can expect to see a test of the $3,000 level as this represents the next level of untested support.